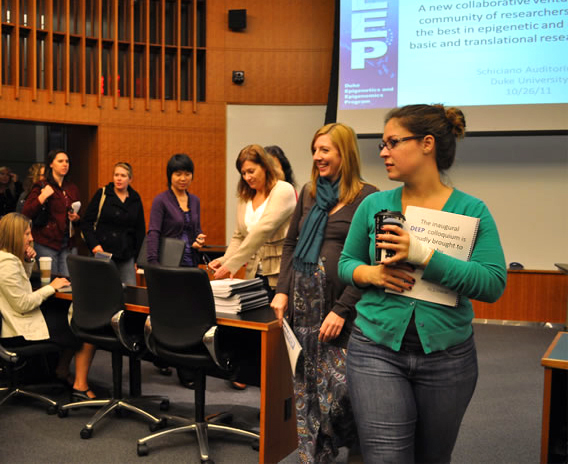 The Duke Epigenetics and Epigenomics Program (DEEP) is a collaborative venture at Duke University designed to unite a community of researchers and students in order to provide the best in epigenetic and epigenomic basic and translational research. Take a look around our website. Explore our links to useful tools, interesting reads, and career opportunities in the field. Join us for our monthly Epigenetics Seminar Series. Dive into the DEEP. Can’t get enough epigenetics, epigenomics, and chromatin biology? We’ve compiled a list of 2018-2019 Duke campus-wide and NIEHS seminars and lectures for you! Explore the Job Postings section. New opportunities are added periodically. The DEEP Executive Committee will evaluate your application and respond to your request for membership promptly. Duke Epigenetics and Epigenomics Program is powered by WordPress at Duke WordPress Sites. Please read the Duke Wordpress Policies. Contact the Duke WordPress team.